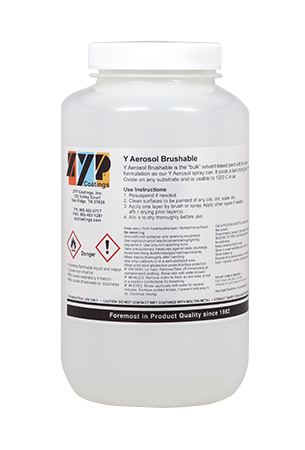 Y Aerosol Brushable - ZYP Coatings Inc.
ZYP Coating’s “Y Aerosol Brushable” is the same formulation that is used in our Y Aerosol spray can … but is in BULK (paint) form, sold by the gallon. The Y Aerosol Brushable can be applied by brushing, traditional air-spraying means, or dipping. Usable in any environment from room temperature to 1900 C (3450F). Y Aerosol Brushable can be diluted with Acetone for somewhat faster drying or with Ethyl Alcohol for somewhat slower drying.